BOSTON/Government Center—With $1 trillion in potential budget cuts that would devastate social programs and adversely effect economic recovery looming on March 1st, a group of Boston community activists and residents took to the JFK Federal Building to present freshman Senators William “Mo” Cowan (D-Mass.) and Elizabeth Warren (D-Mass.) with giant Valentine’s Day cards on Thursday imploring them to do what they can to head off the heavy-handed “sequestration” cuts that become law on March 1st, while protecting medicare, medicaid and vital social programs, cutting defense spending and ending the war in Afghanistan immediately. 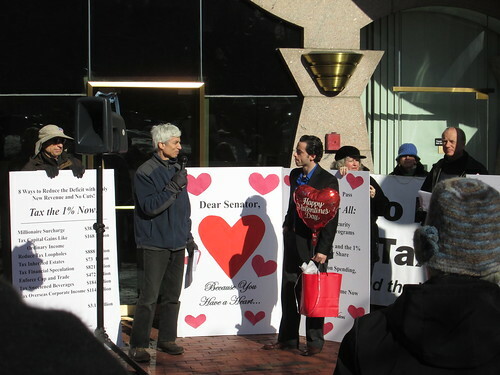 The “Have a Heart” rally was sponsored by the coalition Budget for All, along with the Mass. Alliance of HUD Tenants, American Federation of Government Employees Local 3258, City Life/Vida Urbana and New England United for Justice, among others. The coalition is advocating for the implementation of the "Budget for All", a nonbinding referendum which passed in all 91 Bay State communities where it appeared on the ballot by a three-to-one margin, calling on President Obama and Congress to prevent cuts to Social Security, housing and other vital programs, create and protect jobs, raise revenues by closing tax loopholes, restoring higher tax rates on the top two percent and reduce Pentagon spending to fund domestic needs. The rally began around 12:30 p.m., in front of the federal building at Government Center, with a group leading a sing-along of popular rock standards—such as Pink Floyd’s “Another Brick in the Wall” and The Beatles’ “All We Need is Love”—with lyrics altered for the occasion. Several speakers addressed the assembled crowd, making impassioned pleas for Washington to leave the services they rely on—such as housing and rent assistance, food stamps and mental health services—out of any spending cuts imposed in sequestration negotiations. Roxanne Reddington-Wilde, a community organizer from Action for Boston Community Development, said that, according to ABCD’s calculations, if the sequester goes forward, thousands of the neediest Bostonians will go without services such as fuel assistance and mental health care this year alone—even as the agency tries to save as many services as possible at the expense of staffers. “Two weeks ago I got a letter from ABCD,” said Reddington-Wilde, “saying on March 1, unless Congress changes federal law and the cuts to domestic federal programs don’t go through, on March 1, I may lose my job. Everybody at ABCD got these letters, because ABCD is trying to be responsible and preserve as many services as we can, even at the expense of staff. “We anticipate that, this year alone, over 1,000 people who get services throughout the city will not be able to get them, if this law continues on March 1,” she added. The city of Boston and ABCD stand to lose millions of dollars in education, housing, senior and child care, jobs and low-income heating aid. The rally coincided with Senate testimony by HUD secretary Shaun Donovan and other administration officials on the potential impact of the sequester. Roger Lau, who was named State Director for Warren last fall, after helping her unseat Republican Scott Brown, was presented with a giant-sized Valentine’s Day card—which he gratefully accepted on behalf of the newly-minted senator, following by reading a prepared statement from Warren. The rally formed into marching ranks, and then began the trek to Cowan’s brand new digs at One Bowdoin Square. Once there, a card was also presented to a representative from Cowan’s office. When DC lawmakers struck an 11th-hour deal on New Year's Eve to avert the "fiscal cliff" crisis, all they really did was delay the whole thing for two months. Which brings us to the present. Ladies and gentlemen, meet “the sequester.” Turns out this was what awaited below that nefarious "fiscal cliff." So here’s the rub: unless Congress can untie itself and do something by March 1, a series of automatic spending cuts will take effect—and, to add insult to injury, Congress will be in recess next week, and will not return until Feb. 25, making the probability of these cuts going forward rather high, according to former White House Office of Management and Budget (OMB) analyst Gordon Adams. The delay in the implementation of the now $85 billion in cuts was meant to buy the White House and Congress time to negotiate a better deal, complete with reforms to entitlement programs like Medicare and Social Security. Now it looks a bit more like a hostage situation than a negotiation. And make no mistake, the March 1st cuts would be broad, sweeping and felt by nearly everyone. According to the latest OMB report, annual 5 percent cuts to non defense programs and 8 percent cuts to defense programs will be required, however, because of the fact these reductions must occur over a seven-month period, rather than a full year, the effective percentage reductions will be approximately 9 percent to non defense programs and 13 percent to defense programs. Other budget lines that could be getting cut include education spending, funds available for small business loans, research and innovation, mental health services and social programs like social security, rental assistance, nutrition assistance, unemployment compensation and homelessness programs. Closer to home, it is expected Massachusetts will lose 60,000 jobs as a direct result of sequestration, according to a report released Friday by the office of Representative Ed Markey (D-Malden). Markey told The Boston Globe that blanket cuts could be parried with targeted cuts to defense spending and nuclear weapons, ending oil subsidies and reforming the nation’s tax code. The cuts are not solely limited to things progressives hold dear. The Pentagon defense budget stands to take just as big a hit as social programs, causing many a Pentagon official to warn of the impending collapse of the US as a world power, the “irresponsibility” of defense cuts and the impending loss, as outgoing Defense Secretary Leon Panetta put it in a recent US News and World Report article, of the nation’s status as a first-rate military power. In an open letter, 55 ex-government officials, including former Defense Secretary Robert Gates and former Senators Joe Lieberman, Jim Talent and Norm Coleman urged lawmakers to find a sequestration solution and avert a possible national security crisis. But, scare tactics aside, the protesters presented Senators Warren and Cowan with detailed proposals on how to create $3 trillion in new revenues and $1 trillion in Pentagon budget cuts.